Easy access to stores, restaurants and offices. Being able to get somewhere without driving. Walkable communities with parks nearby. Affordable housing options. If that sounds like a millennial checklist, it’s also a rundown of what seniors need to be able to stay in their communities as they get older – to age in place. When Decatur’s Towne Square condos opened in 2000, the assumption was that residents would be 30-somethings wanting to walk to restaurants and shops, says LeeAnn Harvey, Lifelong Community coordinator for the city of Decatur. Instead, long-time residents of the city saw a place where they could downsize and still stay in a community they loved. And aging in place has benefits not only for seniors. 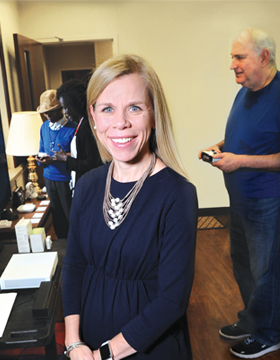 Older adults’ value to a local economy is about three times that of a younger adult, according to Becky Kurtz, director of the Atlanta Area Agency on Aging at the Atlanta Regional Commission (ARC) and manager of the ARC’s Aging & Health Resources Division. If they’re still working, it’s usually at a higher wage level. And if they’re retired, they often bring their savings to spend in the community. And even the changes in environmental design or accommodations they may need help others. “The baby stroller and the wheelchair need the same ramp,” says Kurtz. If seniors’ choices once were mainly having a family member be the caregiver or moving into “the home,” there are many more options now. Staying in one’s home is getting easier for some provided they can get access to home services or get help from assistive technology. Senior apartments and assisted living facilities can be options for those who need no or just minimal care. And some will need the kind of long-term health and daily care provided by nursing homes. The region needs to be “really thinking about having a whole array of services available that individuals will need as they age, and [how well they function] may change,” says Kurtz. It pays to delay long-term care and keep seniors in their communities – literally. Kathy Floyd, executive director of the Georgia Council on Aging, says that it costs the state 10 times more for Medicaid to pay for a nursing home bed than it does to fund in-home care. “Once somebody starts getting that in-home care, generally it delays nursing home placement for 15 or more months,” she says. One thing lack of transportation can impact is getting enough to eat. Addressing food insecurity for seniors requires a dynamic approach, says Abby Cox, director of the state Department of Human Services, Division of Aging Services. The state is working with a number of national partners like the National Foundation to End Senior Hunger (NFESH) to find solutions and has drafted its first-ever plan on senior hunger. Transportation also affects healthcare. “There is emergency transportation available through Medicaid, but if you’re above the threshold for Medicaid it can be a challenge to get to the doctor for follow-up or to get your prescriptions,” Floyd says. She says hospitals have begun to see how they can work with area agencies on aging to make sure that seniors can still get the medications they need when they can’t get to a pharmacy. Case in point: Even Decatur – which has MARTA stations within its 4.5-square-mile city limits and is famous for its walkability – has gaps. It’s especially true in the Oakhurst neighborhood, according to Harvey. There’s no grocery store within walking distance, so the city started a once-a-week shuttle to take residents to downtown, where they can walk to a Kroger, CVS, the library and the recreational center. Down the road in DeKalb County, the new city of Tucker hopes to implement a volunteer transportation program that will provide rides to and from doctor’s appointments, says Lois Ricci, chair of the Tucker Civic Association’s Lifelong Community Committee. (Lifelong Communities is an ARC initiative that helps cities create communities that meet the needs of residents of all ages.) As a new city, Ricci says Tucker is beginning work to become a more age-friendly community and cites strong support from city government. But demand is outstripping the supply of publicly funded services. Floyd says the state has worked to reduce the wait for programs that help people who qualify for Medicaid, but those who are not Medicaid-eligible but still need help include more than 12,000 currently on a waiting list. “Some people are discouraged from getting on the wait list just because of the size,” Floyd says. Technology and assistive devices have the potential to revolutionize aging. “The possibilities of technology to improve the quality of life for older adults is kind of beyond our imagination,” says Kurtz. “Assistive technology is less expensive than bringing in a home health aide,” says Cox. The Division of Aging Services has awarded innovation grants through the state’s 12 area agencies on aging to help develop assistive technology labs, where seniors can try out different technology and devices. It’s a way to introduce seniors to technology they might not know about – or to get them comfortable with using it. For example, Cox says her parents are “technology averse,” but quickly learned to use FaceTime to communicate with their granddaughters. The assistive tech labs range in their offerings. The one at the Coastal Georgia Area Agency on Aging is set up as if it were a studio apartment and includes assistive technology to help people who have mobility issues, vision loss, communication problems and hearing loss, as well as dementia caregivers. Others may be smaller and have more modest offerings. But Cox notes that even seemingly simple devices – like one that holds playing cards – can make a difference to someone with arthritis in their hands. And basic technology like FaceTime or Skype can also go a long way toward combatting social isolation, especially in rural areas. Seniors may be able to virtually join activities at a senior center and see their friends, even if they can’t be on site, Cox says. At the heart of any policy shift or commitment to adding resources to help seniors age in place is a foundational shift in how we view aging, says Kurtz. That spans both the public and the private sector. For example, we tend to think of older people as retired, but many still work. “Maybe they need some flexibility in employment,” she says. “Maybe they prefer to work part-time instead of full-time. Maybe they need certain accommodations at work. They want to stay engaged in the civic activities and volunteer opportunities.” Many of those kinds of opportunities for continued engagement have never been needed at the level they are now – or will be in the future, she adds.